A Marple railwayman's sprint down the railway track averted possible disaster to a packed diesel passenger train at High Lane, on Saturday night. 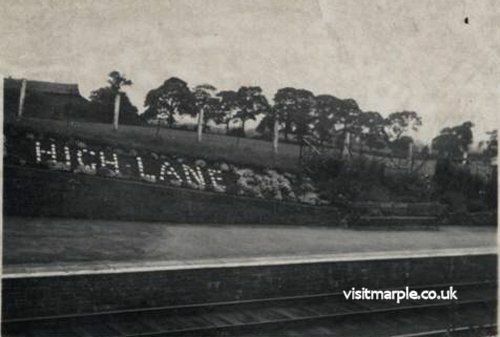 Hero of the drama, witnessed by passengers waiting on the platform, was 45-year-old Leading Porter James Noble, of 15 Mellor View, Lockside, Marple, in charge of the one-man station at High Lane, on the Manchester - Macclesfield line. The was issuing tickets as the 10-40pm train from Manchester was due, when an intending passenger called his attention to three cows straying on the line in the track of the expected train. 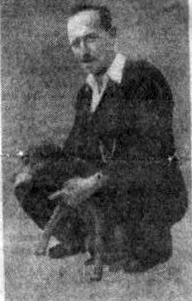 With only seconds to spare Leading Porter Noble snatched up his hand-lamp, leapt down to the track and sprinted under the moonlight, 200 yards towards the approaching diesel train, which he knew was already full with passengers from town for all stations to Macclesfield. His frantically waved red lamp was seen by the diesel train driver only just in time for, with brakes hard on, the train pulled up just touching one of the cows without sufficient force to injure it. When he had recovered his breath, Leading Porter Noble drove the cows further down the line until he found a gateway through which he sent them into a field. Later taken home by car by one of the grateful passengers he told his wife who wondered why he was late, "One of the passengers came into the office and said, "Hi Jim there are some cows on the line"; and I've never run so fast in all my life." 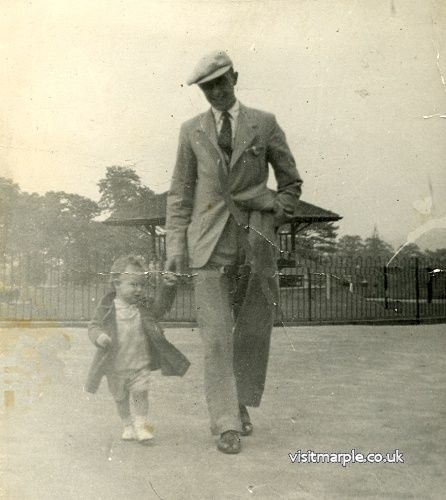 Leading Porter Noble, who has been a railway man for over 20 years, was previously at Marple and Rose Hill Stations. He is married, with sons aged 21 and 17, and has one grandchild. 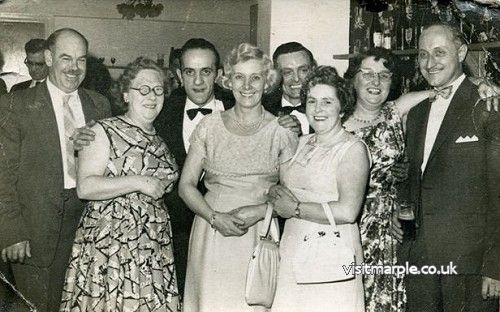 Back row L - R, Mr Dale, Ron Little, Frank Noble, Dorothy Noble, Jim Noble. Front row L - R, Mrs Dale, Mrs Archer (confectioner Hollins Lane) and May Noble. High Lane spelt out in whitewashed bricks and to the right you can just see E||R. 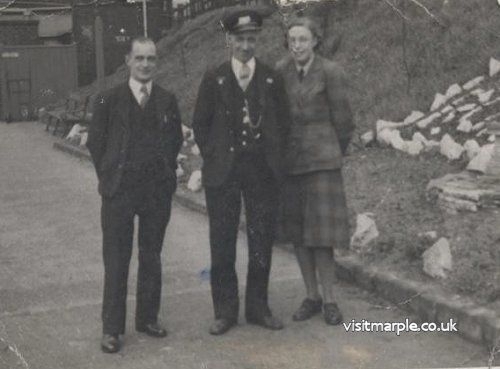 Station Master Sid Grant, Leading Porter Jim Noble and Booking Clerk Mary Baron.